The table below presents views of a variety of artifacts from ancient Mesoamerica. 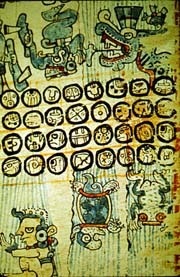 All the objects are from east of the Isthmus of Tehuantepec. These items are intended to convey some of the material culture of the high civilizations during the prehistoric era. Artifacts from west of the Isthmus are featured in the next page. Each thumbnail photo is a link to a larger version of the same photograph. 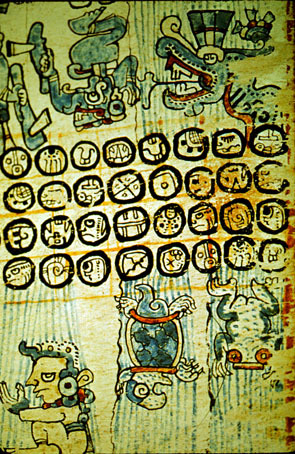 The Madrid Codex is one of four surviving Mayan screen fold books. One of the large and impressive stone monoliths from the Classic Maya pyramid comples of Copán, Honduras. 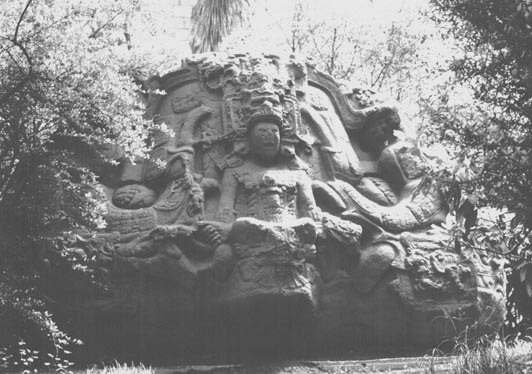 This sculpture is located in the Museum of Anthropology in Mexico City. Special thanks to the Instituto Nacional de Antropología é Historía for permission to photograph. 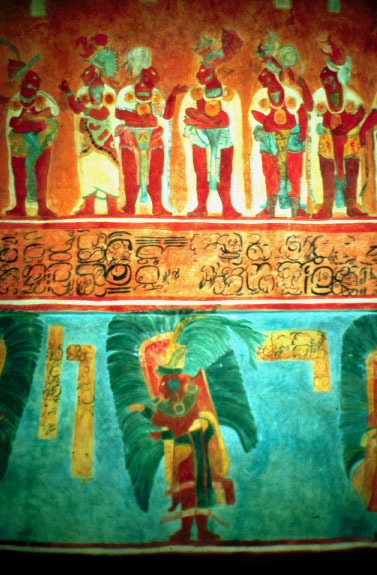 This photo shows a section of a wall mural from Bonampak recreated in the Museum of Anthropology in Mexico City. The entire room, with colorful painting on all the walls can be seen in a courtyard beside the museum. The original is much faded by comparison. Special thanks to the Instituto Nacional de Antropología é Historía for permission to photograph. A stela from La Venta. This is a side panel from a rectangular solid monolith. 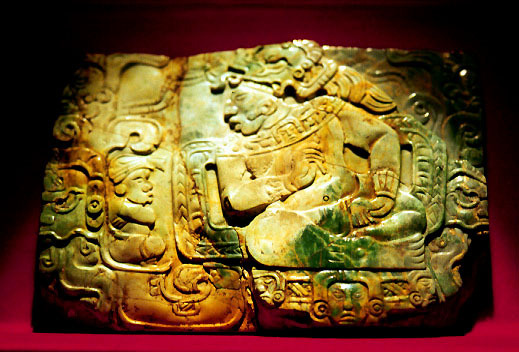 A small, intricately carved jade plaque in the National Museum in Guatemala City. A variety of jade and gold artifacts are housed in a walk-in vault. 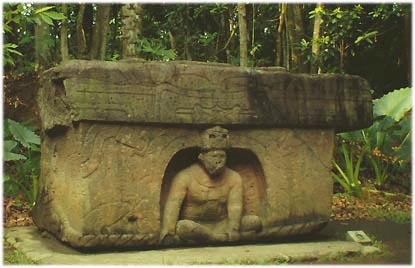 A Quiche burial urn from the Popol Vuh Museum in Guatemala City. 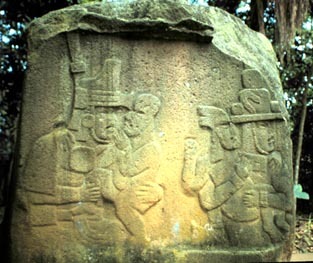 This large, monolithic stone carving from the Olmec ruin of La Venta has been relocated to Villa Hermosa. 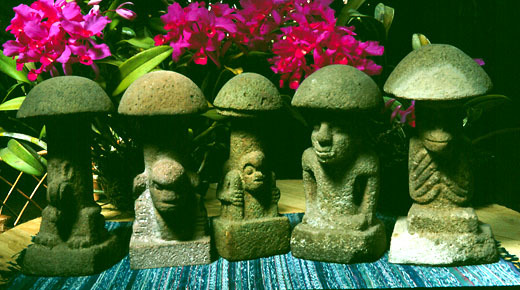 A group of small stone carvings in a private collection in Guatemala City. 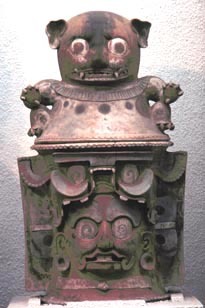 The earliest style of these Guatemalan hemisphere topped sculptures have tripod legs. Iconographic associations indicate that the hemispheres represent the vault of the celestial sphere.